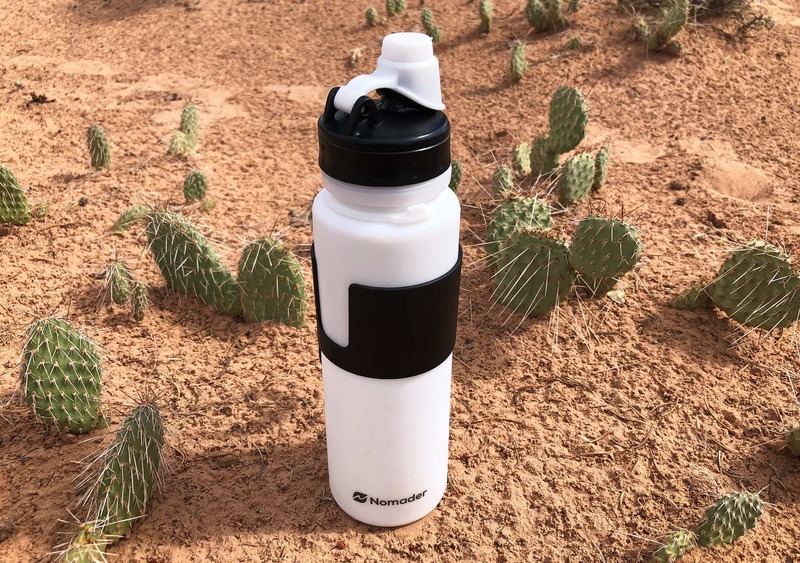 The Nomader Collapsible Water Bottle is a versatile, flexible choice that can be rolled up and taken just about anywhere with you—although it’s not as compressible as we’d like. 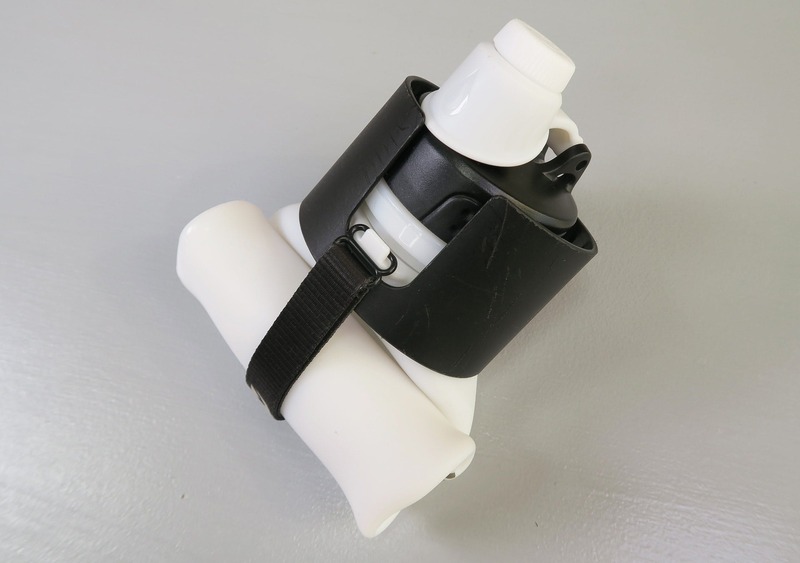 The Nomader Collapsible Water Bottle is a solid choice for air travel and more. With flexible qualities and several other perks, you may want this bottle with you “nomader what”. (See what we did there?) Point being, we’ve been enjoying our use of this water bottle thus far, however, we’ve also found a couple of gripes. Let’s dive into the details. 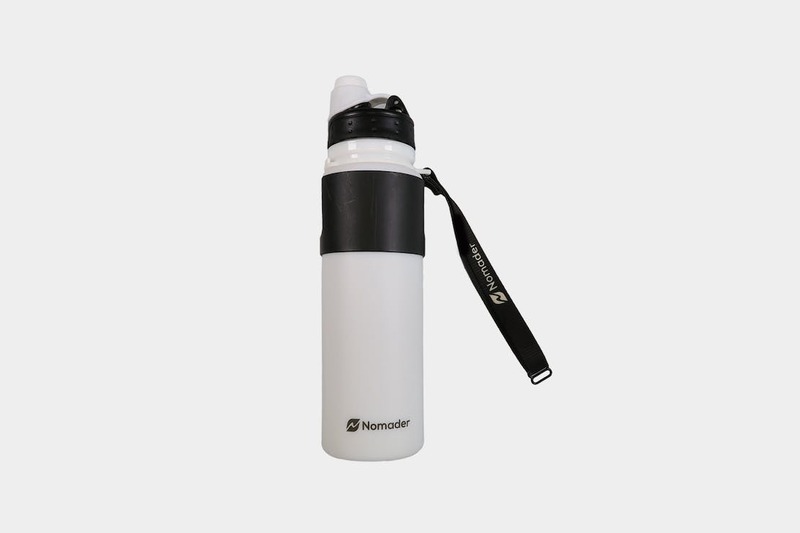 The Nomader Collapsible Water Bottle is made of food-grade BPA-free silicone rubber, food-grade BPA-free polypropylene plastic, and polyester. 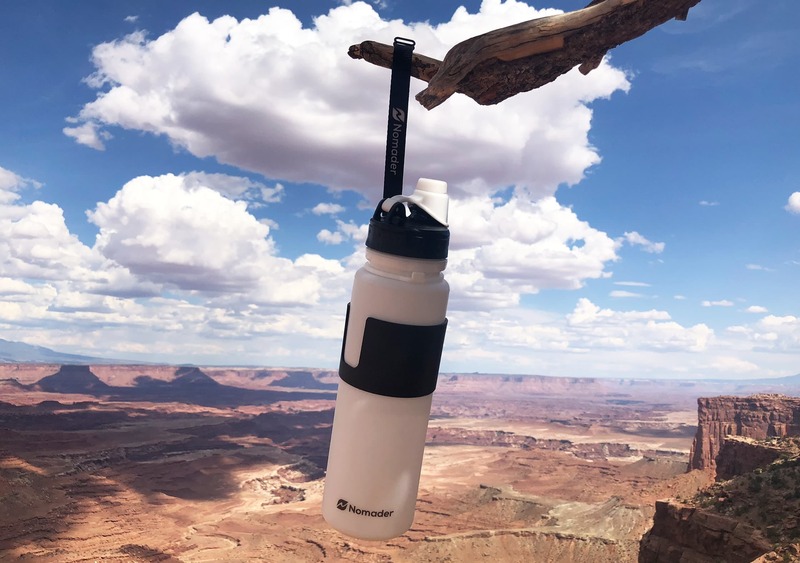 Nomader advertises their bottle to be made with shatterproof silicone—which is pretty much a no-brainer since we can’t think of one scenario where silicone has been shatter-able. 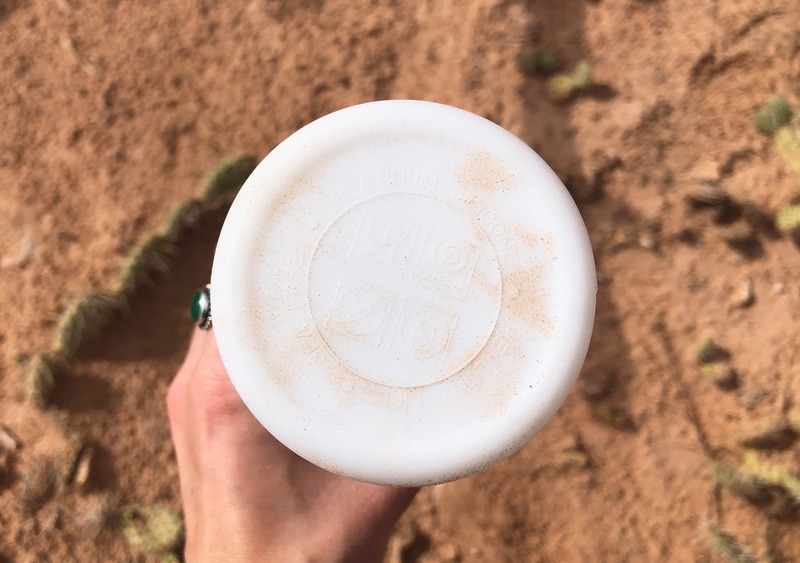 Either way, we’ve found these materials to be pretty great for a water bottle that sees rough usage—which ours has seen plenty of during testing. We should also mention that the silicone is soft to the touch and very easy to grip, a nice feature. We chose to test the white version, but if you’re feeling more vibrant Nomader offers a number of colors to keep things interesting. Their logo is placed on the carry strap and lower half of the bottle, keeping things relatively simple—just how we like it. The bottom of the bottle has a couple small reminders—such as to keep away from flames and knives. It seems a little odd that these need to be added on as reminders (“Oh, I totally forgot that I’m not supposed to put my water bottle in the bonfire! ), however, you probably won’t even notice them since they’re imprinted into the silicone. Which does seem to contradict the whole “reminder” thing but we’re guessing Nomader had to add these for legal regulations. The Nomader Collapsible Water Bottle has been a great addition to our travels so far, but as always, we do have a few minor nitpicks. One thing to note is that you’re going to want to disinfect your bottle before any usage, as Nomader recommends, and we do too. Simply submerge the bottle into boiling water and voila! 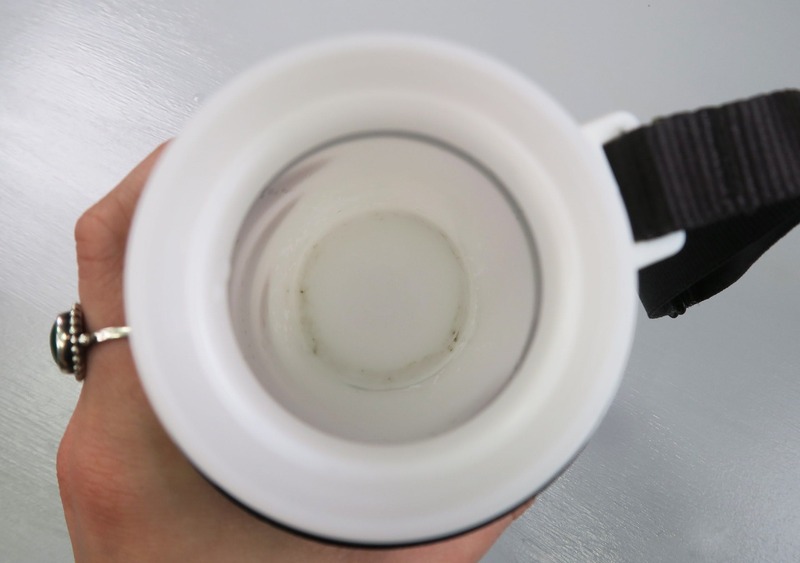 We have noticed that after putting our white water bottle through various environments, it’s picked up some dirt along the way. We’d choose a darker color such as black or dark blue for the next time around as the white version seems to be a bit more noticeable than we’d have hoped for. Thankfully, a quick soapy wash gets the exterior dirt off. Even though Nomader approves of dishwasher usage, we’ve found hand washing to be much more successful. With that being said, we HIGHLY recommend using a brush to safely clean the interior, as sneaky dirt may build up inside without you even realizing. We’ve been pretty good about cleaning ours on a day-to-day basis but have noticed a bit of dirt build up on the inside when letting a couple days slide by. Make sure to keep your bottles clean, people! 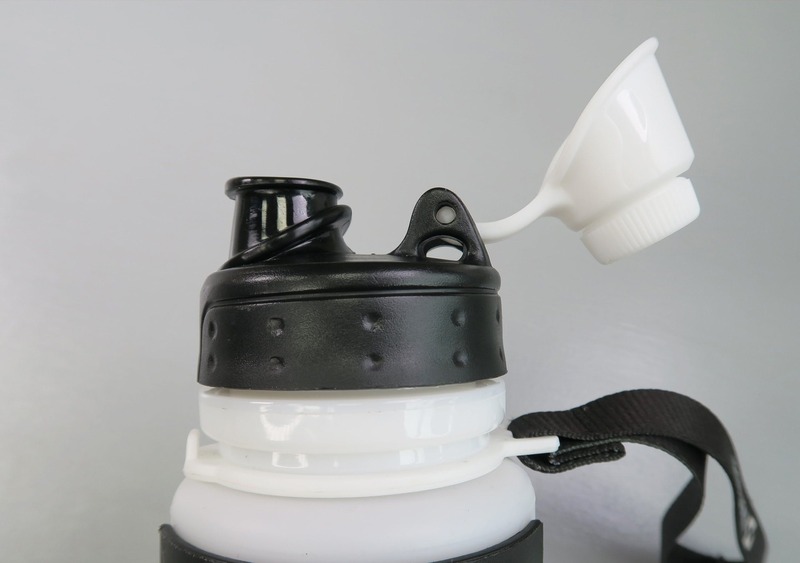 Arguably, our favorite part of the entire water bottle is the ergonomic carry strap (which, actually isn’t arguable at all actually because we have seriously been loving this feature). The strap has been super helpful when balancing numerous items, juggling items, and clipping onto the exterior of our packs when hiking or walking around the city for easy access. Keep in mind, the carry strap acts as the compression strap when the bottle is rolled up. We’ve found it’s 25 ounce capacity to be a perfect amount for sustaining hydration during average hikes and flights. Rarely have we been in a situation where you need more than 25 ounces of water—most of the time you’ll have an opportunity to refill it before you finish it. 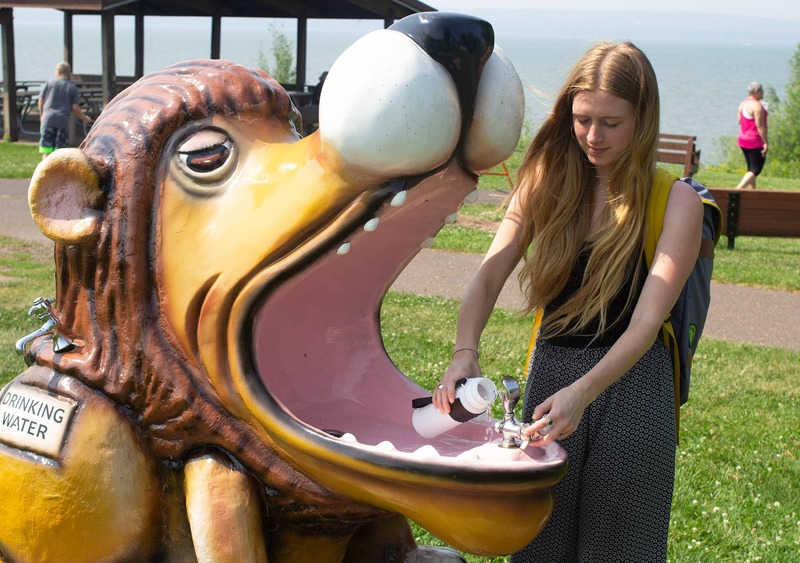 Just find a nearby water fountain and fill up when necessary! Utilizing this water bottle is also a great way to keep plastic water bottles out of the landfill—an additional thumbs up on our end! Even though it’s collapsibility is probably it’s largest feature—hence the name—we actually haven’t been rolling it up that often unless heading to the airport. Really, the largest pro to rolling the bottle up is exactly that—when traveling via airlines or packing up your load. Then is when the feature really shines! Talk about easy packing—this water bottle has got it going on. Although, when talking about “ease,” we wouldn’t say it’s a breeze rolling this thing up your first time. We had to look at the directions our first time around, but after that we picked it up quite easily. Just remember (if it’s not a no-brainer already) the water bottle has to be completely empty to successfully roll up. Once the bottle is completely empty, align the hard plastic sleeve slot with the carry strap, slide up the sleeve until it’s bottom meets the top of the silicone body, roll up the starting from the bottom, wrap the strap around the rolled up bottle, and latch the carry strap clip to the plastic latch. Nomader puts a large claim on their bottle by saying it’s “leakproof guaranteed.” Usually we’d be skeptical, but we haven’t had one leak yet. You can see how it holds up over time in our usage timeline at the end of this review—although, we think it will do just fine from our testing thus far. The unique screw cap and lid design definitely does a fantastic job ensuring your water stays inside the bottle at all times. One thing we really do wish this bottle had is some insulation—which is difficult to integrate with a collapsible bottle. Nomader says you can put both hot and frozen beverages in this thing, but silicone and steamy coffee don’t seem to mix well in our minds. We’ll stick with our water and ice cubes, thank you very much. On top of that, the lack of insulation means we’ve had to sacrifice our icy beverages for collapsibility. Worth it? It’s a tough call but we’ll let it slide for now. If the lack of insulation results in a not-so-wonderful lukewarm beverage, the wide mouth of the bottle is great for adding ice cubes whenever you’re feeling like a pick me up. 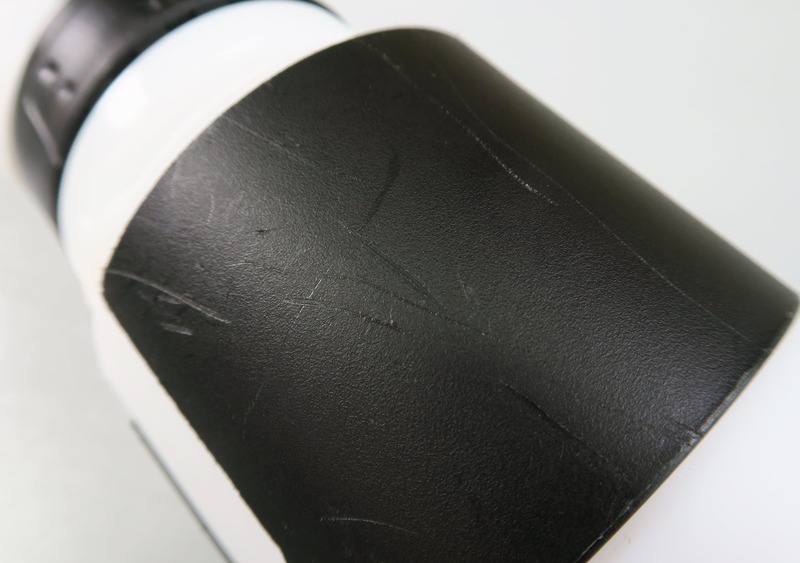 The screw cap top of our bottle has seen a bit of rough usage and now has a few dings, along with quite a few scratches on the plastic sleeve. We’re not loving that look, but willing to compromise for the qualities we do enjoy. In addition to the dings and scratches, there seems to be a bit of loose threading on the strap, which is also not ideal but worth compromising for the other great features. And did we mention Nomader offers a Lifetime Warranty? Yeah, lifetime. You have to register for the warranty benefits, and we haven’t had a reason to test this ourselves. Enjoying the versatility of this water bottle. We just wish it kept our water cold(er)! Developing a couple dings and scratches. Still loving the carry strap. However, we’re sad to say it’s accumulated quite a few scratches and the inside dirt is difficult to clean out. The carry strap is incredibly useful when on-the-go. Flexible roll-up ability for air travel and more. We haven’t seen one drop leak out of this water bottle yet. Score! No insulation = no keeping your beverage hot or cold. Silicone exterior easily picks up dirt. A tad difficult to clean out—make sure to get a brush to thoroughly clean the inside! 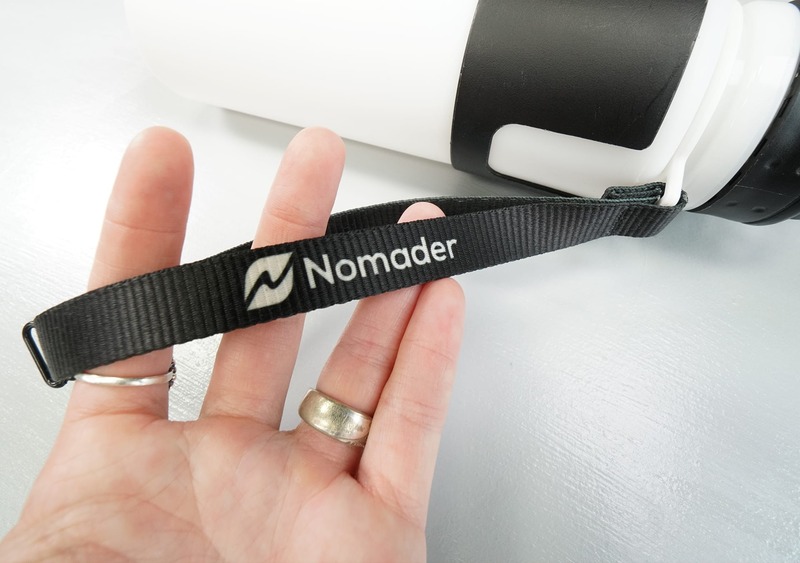 At the end of the day, the Nomader Collapsible Water Bottle is a flexible option for air travel or any on-the-go individual. However, our few gripes, including it’s lack of insulation and relatively easy build up of dirt, take a toll. On the other hand, we’ve found the carry strap to be super helpful for full hands and quick grabs, and one of our favorite features is its ability to roll-up and pack away quickly.